Take control of your Rebel T2i and the images you create. Please contact me to purchase the PDF, or see the links below to purchase other versions. or transferred and read on a Kindle, Nook, or other eReader, iPad, or iPhone. The iPad and iPhone version is available at Apple iTunes or through the iBooks App. 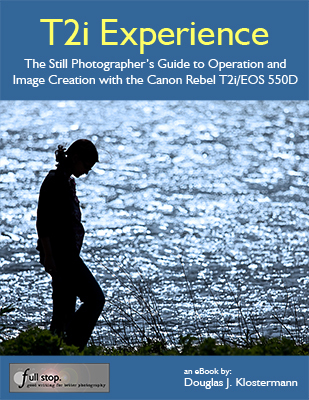 T2i Experience - The Still Photographer's Guide to Operation and Image Creation is an eBook user's guide and tutorial for the Canon Rebel T2i / EOS 550D. Learn to use your Rebel T2i / EOS 550D, quickly and competently, to create the types of images you want to capture. The Canon T2i / 550D is an advanced tool, and this guide explains how to use it to its full potential. Take control of your camera, the image taking process, and the photos you create. This instant download Canon T2i / 550D book is for those who wish to get more out of their camera and to go beyond Auto and Program modes and shoot in Av mode and Tv mode. To get you started, it includes explanations and recommended settings for all Menu settings, Movie Mode Menu settings, and Custom Function settings of the T2i/550D. It covers basic dSLR camera functions and exposure concepts for those new to digital SLR photography, and explains more advanced camera controls and operation, such as using the various metering modes and exposure compensation for correct exposure of every image, controlling autofocus modes and focus points for sharp focus of still or moving subjects, and utilizing dramatic depth of field for professional looking photographs. You can preview T2i Experience at the following link. The preview shows the Table of Contents and Introduction, a sample T2i/550D Menu Settings page, a sample T2i/550D Custom Functions Settings page, and a sample text page. Setting Up Your Rebel T2i / EOS 550D - All of the Menu settings and Custom Function settings for the T2i/550D, including movie mode menus, with brief descriptions and recommended settings for practical, everyday use. Set up and customize the advanced features of the T2i/550D to work best for the way you photograph. Exposure Metering Modes of the Canon T2i/550D - How they differ, how and when to use them for correct exposures in every situation. Also how to make use of exposure lock. This digital field guide to the Canon Rebel T2i / EOS 550D is an 85 page, illustrated PDF document that builds upon the information found in the T2i / 550D manual, and will help one begin to master their dSLR and learn to use the Canon T2i / 550D to its full capabilities! Best Guide to Using a T2i - I don't know how I could fully take advantage of all the features the T2i has to offer without this publication! It's well-organized, easy to understand, and succinct enough to keep your attention while still containing a wealth of tips and tricks to get the most out of your camera. I'm very happy that I found this guide. Essential Travel Companion - Alas, a comprehensive and concise guide for hobbyists who desire to enhance their photography experiences. I highly recommend this guide to anyone who wants to ease out of auto mode and learn how to take high-quality photos. It brilliantly explains how to apply advanced techniques and tips, walks you through the daunting task of menu settings, and smoothly guides you through the image-taking process. The instructions and brief explanations are easy to follow and well organized. The guide is a portable class on digital photography! A must-have if you want to learn how to use your camera to its fullest advantage. A Fantastic Book For Beginning T2i Users - This book has exactly the no frills condensed practical advice on camera settings that I was looking for. The author has a gift for separating the wheat from the chaff. I didn't have a clue how to operate a digital camera, let alone know the definition of the technical terms. After reading this book, I now understand all the critical functions of the Canon T2i and how to take advantage of them. This is a book I plan to keep handy for years to come. I found the (camera's) manual good for understanding how to set things up but not much on the why - this book really focuses on the "why." The guide helped me understand why to use specific settings for specific needs. The Custom Settings sections helps to make firm decisions on how to apply settings by understanding the usage of each in addition to knowing how to set them up. I would like to thank you for saving me time - now I'm confident that my camera is well tuned! 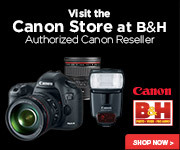 with this Canon Rebel T2i / EOS 550D e-book user's guide.